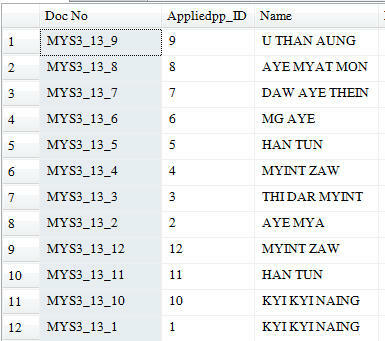 What is the Appliedpp_ID data type ? Is it integer ? Please confirm your datatype in table schema. 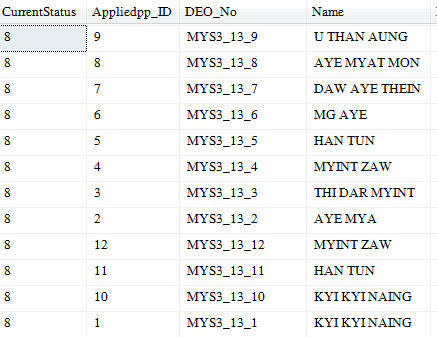 I do believe, current data type is character. can you show the data type screen shot ? Not related to your question. But I don't understand why first part "SELECT * FROM ..." is required. If this is a complete query, can it be done like below? Your column 'Deo_No' is string type (varchar or nvarchar). That's why you cannot sort correctly. If you really need it, you can sort by using substring and type casting together like below. If not, you may need to change accordingly. I.e. "MYS31_123_11" will not work. If you can use another number-type column to sort, it should be the best. Because substring and type casting may impact your query performance while you already have multiple criterias defined. Have you checked your table schema? So far, you do not understand the differences of character and numeric. That is more important than getting the working query for you.